It is true when they say, “People may take a job for more money, but they often leave it for more recognition” Employee retention is one of the most important factors that determine the credibility of your company. And yes, Corporate India seems to recognize the importance because recently Ericsson devised a new method of being the bearer of good news. Employees were informed about their promotion through their family members! One sure shot success policy, Ericsson is beaming with pride ever since. “It is much more satisfying when your family tells you about your promotion,” says Sameer Khanna, VP and head of HR, Ericsson India. In LinkedIn’s employee survey, the results put the employee’s immediate family as one of the main reasons for his/her performance. Its sometimes the most obvious that is the most forgotten. The LinkedIn survey reported 60% of their employees considered their parents a huge driving force in their careers. 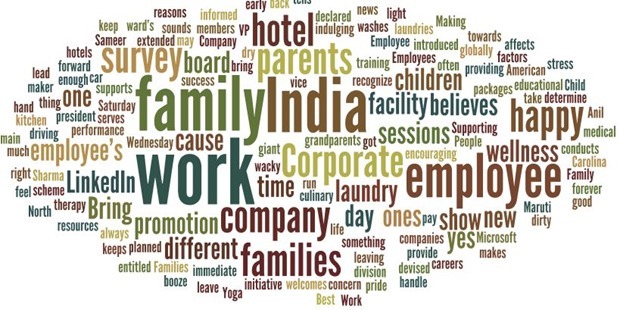 In the light of this survey, LinkedIn India declared November 7 as “Bring In your Parents” day globally wherein employees can get their parents or grandparents for work. Microsoft on the other hand launched “Bring Your Child to Work” which is also extended to their spouses and beloved ones who are given a tour of the facility and many indulging activities are planned for them. And yes, the employee gets off work that day. Soon enough, Ericsson followed the lead by encouraging employees to get their little ones to work. The American hotel chain, Best Western also introduced this scheme wherein the chefs were allowed to bring their children to their hotel kitchen for a short culinary skill program wherein they were educated about making cold desserts and got them familiarized with the work environment there. Supporting the employee’s family isn’t a very new thing for Maruti. The car maker has been providing therapy to handle stress when it’s comes to their ward’s board examination which apparently is a huge cause of worry for parents. They also provide IT training for employees and their children every Saturday. “Families influence the employees and their well-being affects the employee’s work life,” says Anil Sharma, vice president — human resources, hotels division, ITC. The hotel conducts wellness sessions like Yoga, medical, educational sessions for it’s employees. The telecom giant also supports the employee wellness cause and believes they’re entitled to a “Early Wednesday” to be with their families. The employees can wind up their work early to spend time with their families. A different type of initiative, Wilton Conner Packaging Company, North Carolina keeps the employees and their families happy doing something different than the above mentioned companies. The company does their laundries! As wacky as it sounds, it’s a huge hit among employees. They can get their dirty laundry and the laundry facility washes, dry cleans, presses and packages these clothes back to the employee right at the time of leaving. To steer a company forward, no doubt a management committee serves the purpose but in the end, it’s always the employees who run the show. To keep them happy, know what makes them happy. A bottle of booze and more pay ought to do it for a month, if you’re targeting forever, then indulge in a meaningful programs.